The Modern Marks collection by Christa Watson makes a magazine appearance again (click here to see our previous post), with a bright and cheery breath of fresh air--spring really is around the corner! Nancy Scott designed the cover quilt for Quilter's World Quilts You Can Make in a Day issue, and it's a beauty! Keep reading to learn more about her quilt. What attracted you to Christa’s Modern Marks collection? I had met her at a conference before she started designing fabric and we became friends, encouraging each other in our quilting work. 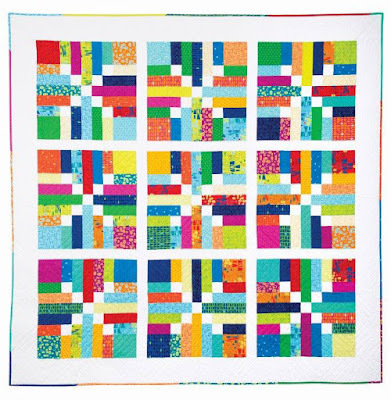 When she began designing Modern Marks, she invited quilting friends to consider using the fabric in projects. I had magazine submissions due, and I loved the bright fresh look of the fabrics. What’s something we may not know about the quilt design just from looking at it? It’s made using precuts—both 5” squares and 2-1/2” strips. 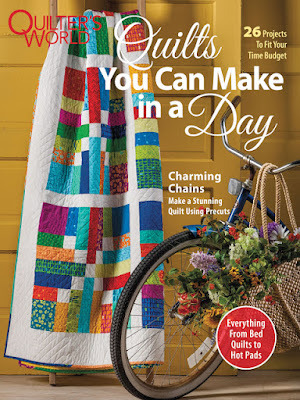 That makes it easy for fabric shopping—just grab and go—and also speeds up the process of making the quilt. I’ve always gravitated toward chain designs that give movement so the eyes flit across the quilt. To make this quilt more manageable and workable with precuts, I decided to use a smaller block where the chain doesn’t travel all the way through. I think the chain looks like little Xs. 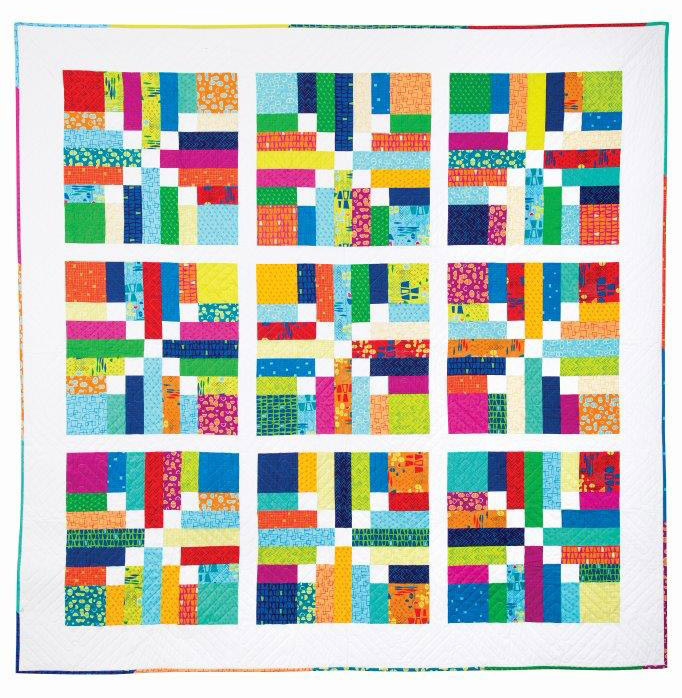 The quilt has a whole has a nine-patch look. I used a white tonal for the background, so the colors pop. I pretty much used the grab bag approach as long as I wasn’t putting two pieces of the same color next to each other. Each block is made up of four smaller units, so I tried to grab prints that I hadn’t already used within the block. It’s an edge to edge pattern called Tread from Tammy Finkler Oberlin. It creates a really nice overall texture for the quilt. Definitely the vibrancy of color. It’s not neon coming at you, but it has so much saturation. The colors are so rich and deep. Click here to see the entire Modern Marks collection by Christa Watson. Click here to visit Nancy's blog. Click here to find the magazine issue on the Annie's Publishing website.